If you like to keep your life organized and your inbox clean, or you don't like junk mail clogging up your inbox, you need to know how to delete an email on the iPad. It will soon overwhelm you if you don't. 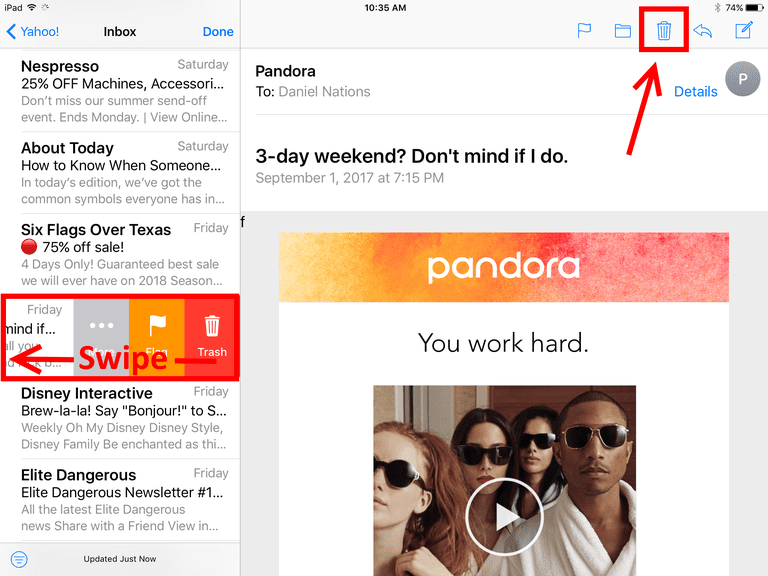 Apple made this task simple in its Mail app, where there are three ways to delete email. If you use the Yahoo Mail or Gmail apps or access them with the iPad's Mail app, the process is just as easy. The easiest way to delete a single message on the iPad and probably the most familiar way is to tap the Trashcan. This deletes the mail message you currently have open in the Mail app. The Trashcan icon is located in the top-right corner of the Mail screen. This method deletes the email without confirmation. It goes to the Trash folder, where it can be retrieved if you make a mistake. If you have more than one email message to delete or if you want to delete a message without opening it, you can use the swipe method. A swipe from right to left on a message in the Inbox, reveals three choices: Trash, Flag, and More. Tapping the Trash icon deletes the email. If you are in a hurry, you don't even need to tap the Trash button. If you continue swiping all the way to the left edge of the screen, the email message is automatically deleted. You can use this method to delete several emails quickly without even opening them. Want to delete more than a few email messages? Swiping to delete is fine if you want to get rid of a couple of emails, but if you need to do a serious cleaning of your inbox, there's an even quicker way. Tap Edit at the top of the Inbox list of emails. Tap Trash at the bottom of the screen to delete them. You can also use this method to move them to a folder, mark them as Read or Unread, or move them to your Junk folder. If you use Google's Gmail app for your inbox, you can delete messages using the Trashcan method similar to the Mail app. Google's Trashcan button looks slightly different from the one in Apple's Mail app, but it is easily located at the top of the screen. You can delete multiple messages by first selecting each message by tapping the empty box to the left of the message in the Inbox section of the app. You can also archive messages, which removes them from the inbox without deleting them. You can archive a message by swiping from left to right on the message in the inbox. This shows the Archive button. If you access Gmail from inside the Mail app, it works the same as Apple Mail. The app has a separate mailbox section for each email provider with all the same options. The official Yahoo Mail app makes it simple to delete a message. Slide your finger from the right side of the message to the left to reveal the Delete button. You can also tap the message in the Inbox and locate the Trashcan button at the bottom of the screen. Tapping this button deletes the highlighted email message. Yahoo Mail can also be configured to be accessed in the Mail app. This is a common question, and the answer depends on which service you use for email. Email services like Yahoo and Gmail have a Trash folder that contains deleted email. To view the trash folder and undelete any messages, you need to navigate back to the Mailboxes screen. The iPad's screen should read Mailboxes at the top left. If it doesn't, look for a navigation link with a left arrow to guide you back to the main mailbox menu. For example, if you are in Yahoo mail, the link will read < Yahoo. Click this link to return to the main mailbox. Scroll down the Mailboxes menu until you locate the section for your mail. Each email provider has its own section. You should see a Trash folder for each provider, which you can open by tapping on it. To undelete a mail message, you move it from the Trash folder to the Inbox. Select the message you want to undelete and tap the Move button. In Mail, it is the button at the top of the screen that looks like a folder. After tapping the Move button, you are prompted to choose a destination folder. Tap the Inbox folder to send the message there.